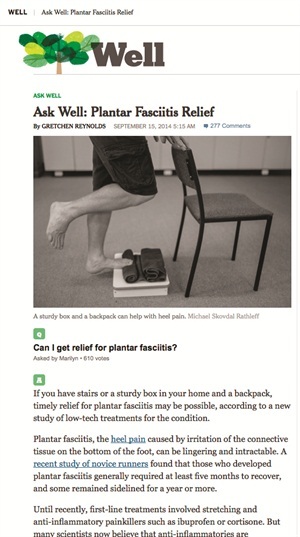 As reported in the New York Times in September, a new study published in the Scandinavian Journal of Medicine & Science in Sports finds that a simple exercise, easily done at home, is faster and more effective at treating plantar fasciitis than conventional treatments, such as stretching and anti-inflammatories. Plantar fasciitis is an inflammation of the plantar fascia, a thick band of tissues that runs from the heel to the toes. Starting at the heel, the band fans out to connect to each of the toes. It is engineered to act as a shock absorber for all the pounding the body takes. However, all that pounding can cause small tears in the plantar fascia, creating an irritating, inflamed source of pain. According to the article, the sufferer should stand barefoot on the affected leg on a stair or box, with a rolled-up towel resting beneath the toes of the sore foot and the heel extending over the edge of the stair or box. The unaffected leg should hang free, bent slightly at the knee. Then slowly raise and lower the affected heel to a count of three seconds up, two seconds at the top, and three seconds down. In the study, once participants could complete 12 repetitions fairly easily, they donned a backpack stuffed with books to add weight. The volunteers performed eight to 12 repetitions of the exercise every other day. After three months, those doing the exercise saw their pain and disability decline significantly. Those who did conventional stretches, on the other hand, showed little improvement after three months, although, with a further nine months of stretching, most reported pain relief.